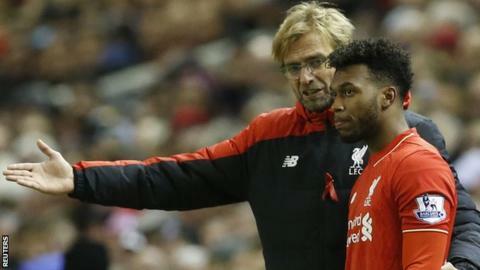 Liverpool striker Daniel Sturridge, 26, will be absent for at least another 10 days as he continues to battle injury. Sturridge, who has made only 10 Premier League starts since the beginning of last season, has not played since injuring a hamstring on 6 December. Manager Jurgen Klopp says he will be patient with the England forward. "Out of responsibility, we have to do everything we can to give him the physical strength to be able to play Premier League football," Klopp said. "To have a player like Daniel in your squad is always a good situation. When it's not possible to use him, it's not a good situation. "We have enough games this season when we hopefully can use him, but not, if nothing happens, for at least the next 10 days." Sturridge, who joined Liverpool from Chelsea for £12m in January 2013, has suffered a series of injury troubles during his time at Anfield. He suffered four separate setbacks last season, including a torn hip muscle that required surgery, and has managed just six appearances in all competitions this term. I understand why Jurgen Klopp and the Liverpool fans want him back, because they are not doing as well without him.But if Daniel Sturridge does play when he is injured, then he is just going to cause himself more damage.